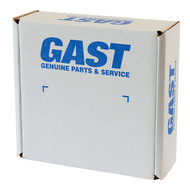 Gast K478 service/repair/rebuild kit used on 0323/0523 oil-less "Q" models with internal filtration. Service kit returns your unit to original factory performance specifications. Recommend for service every 2 years. Important: Use Gast AH225D flushing solvent to flush debris from pump when servicing unit. Service kit includes: (4) AH850A Vanes, (2) AK524 Filters, (2) AK473 O-Rings, (1) AK521 Gasket and Instructions. Fits many 0323 and 0523 units including 0323-101Q-SG588DX, 0523-101Q-SG588DX, 0523-V184T-SG588DX and 0523-V191Q-G588DX models. SPECIAL OFFER: Save $10.00 on Gast AH255D flushing solvent with the purchase of a K478 - 0323/0523 Oil-less Service kit.